Stampin with Mel: Party with Cake - Happy Birthday! With a few Sneak Peeks! Party with Cake - Happy Birthday! With a few Sneak Peeks! I'm lucky enough to have not one, but TWO unwell kids at home today! We are soldiering on though and for now I am able to add a few posts! We are so close to saying farewell to our current Annual Catalogue - click HERE to see what products will be retiring on the 31st of May, because once they're gone , they're gone!! 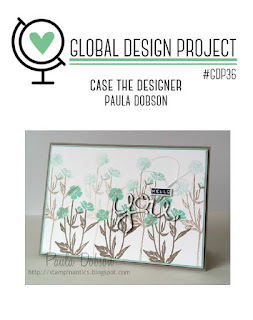 Today I'm once again taking part in the Global Design Project #036 CASE the Designer challenge! Paula Dobson created a beautiful card this week and I was inspired by so many features... one of them the colour combination! Well more or less, I used Crumb Cake and Mint Macaron! This card has no owner yet and I would so love to send it to someone for their upcoming birthday! If you want, leave your details and it might just be you! What beautiful inspiration! Thank you Paula! See that shine?! Coming soon! (I cannot add the Sneak Peek products yet, but if you spend between $50 and $249 and use the Hostess Code for May, I can send you the NEW Catalogue to drool over until they become available 1 June '16)! Remember if you Join the Party between now and May 31st you can order pre-order products as part of your Starter Kit! Don't forget to always use your Embossing Buddy before heat embossing! I promise it makes all the difference, especially when heat embossing on dark card stock, Vellum and with White embossing powder! Ink up those Embossing Folders! It adds even more value to those already beautiful Textured Impressions Embossing Folders. As always I thrive on your comments! Let me know what you think! And Pin away!! Also don't forget to actually mail or hand over those Birthday, Thinking of You and Thank You cards you create! We have to bring Snail Mail back - one card at a time! This is "Fluttering" amazing! WOW. I am embarrassed to admit I have never used that embossing folder, I LOVE all things butterfly so I can't understand why I have not used it. You have inspired by to use it for my next card. Inking one of the sides is a great idea also. I am so happy we have smaller square framelits coming, and you have shoowcased them so well. Thank you for playing with us at Global Design Project. How did you know it is my birthday tomorrow Melodie - seriously!! I won't tell you how old though, lol. Your card is just drop dead gorgeous, especially with the beautiful shine on it. 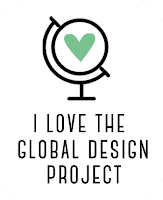 Thanks so much for playing along at Global Design Project with us this week. Well then you share a birthday with my sister Paula! Thanks for dropping in and for you beautiful card inspirations! Wow....this card is super gorgeous Melodie. Such a beautiful use of these colors, Mel! This is a lovely card! Thank you for playing along with this week's CASE the Designer Challenge! Love how you have used the new square dies here! And all the copper shine is just beautiful! Thanks Julie! The square dies make it so easy!